Jimmy Page is identified with the 1959 sunburst Gibson Les Paul Standard the same way Jimi Hendrix is identified with a white Stratocaster. But when your singer is rock’s Golden God, and you’ve been making music professionally for more than 50 years, things are a bit more complicated. You’ve got history, a gear budget and the legit opportunity to write that stuff off as a business expense. So what kind of gear does Jimmy Page use? Any kind he wants; that’s what kind of gear Jimmy Page uses, and the idea of listing every acoustic and electric guitar, mandolin, banjo, cello bow, effect pedal, cable, tube and amplifier that Page has used — and their many combinations — is well beyond the scope of this story. Helping you convincingly recreate Page’s sound with commercially available hardware — and maybe with gear you already have — that’s the idea behind “Nailing it.” And because “Approximating the Sound of Jimmy Page” doesn’t have quite the same ring. In this video, we're looking at some basic combinations of modern pedals and settings you can use to achieve Page's tones. Check out our first two installments in the series: Nailing It: Achieving the Tones of Jimi Hendrix and Nailing It: Achieving the Tones of David Gilmour for tips on how to sound like the masters. Page predominantly plays Les Paul Standards, including his No. 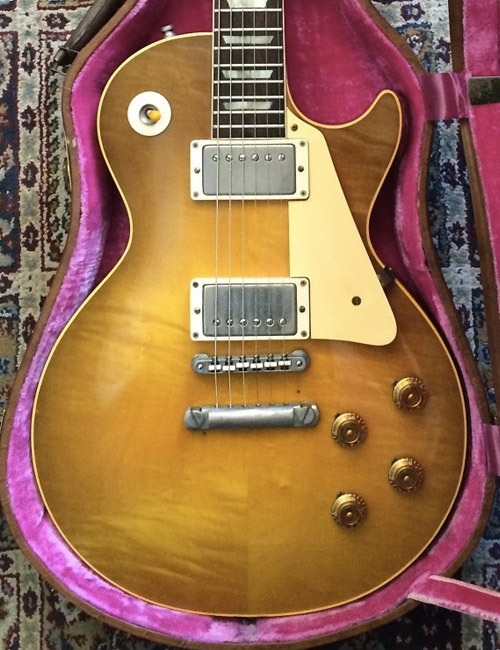 1, the 1959 sunburst that you instantly conjured in your mind’s eye when you read the words “Jimmy Page.” It’s the guitar he bought from Joe Walsh in 1969 and used to record "Whole Lotta Love" and most of Led Zeppelin II. 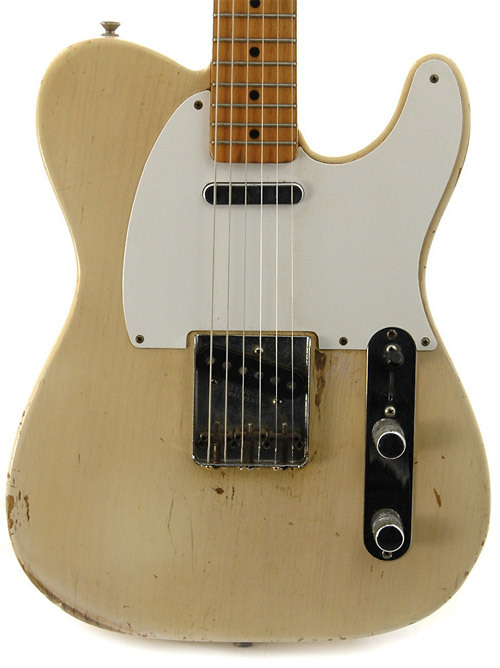 The Dragon started out as a 1959 blond Tele with a white pickguard, and was gift from Jeff Beck, then The Yardbird’s other guitar player. Beck reportedly bought the guitar from The Deltones’ John Owen, with whom Beck briefly played; Beck later swapped in a black pickguard. In 1967, Page stripped off the finish and went a little crazy with some day-glo paints. Psychedelic drugs may have been involved in the decision and execution. Then he tossed the black pickguard and replaced it with a clear one backed with some reflective materials. After a second and ill-fated paint job, The Dragon was parted out, Page explained in a 1998 interview with Guitar World. 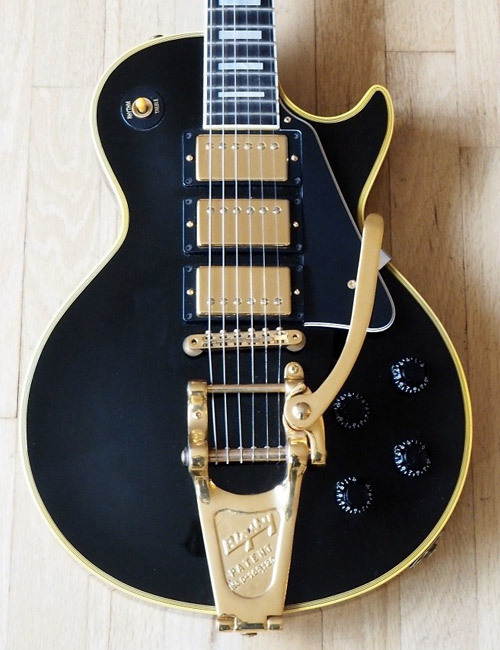 Les Paul Custom “Black Beauty” with three pickups and a Bigsby, which he used for most of his session work and solo singles between 1963 and ’68, according to Gibson. Gibson EDS-1275. The double neck he’s been known to play on “The Song Remains the Same,” “The Rain Song,” and “Stairway to Heaven,” according to Gibson. 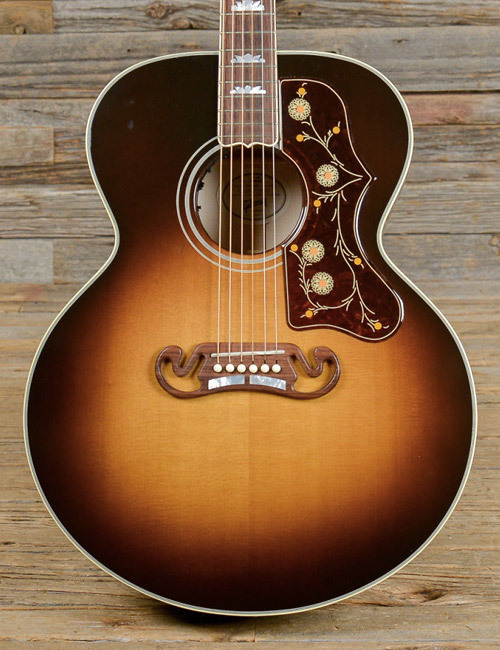 Gibson J-200 acoustics are among his frequently favored acoustics. The gigantic sound of Led Zeppelin is instantly associated with huge walls of British amps, mostly Marshalls, a sound Page frequently created in the studio with small American amps that he pushed. Hard. 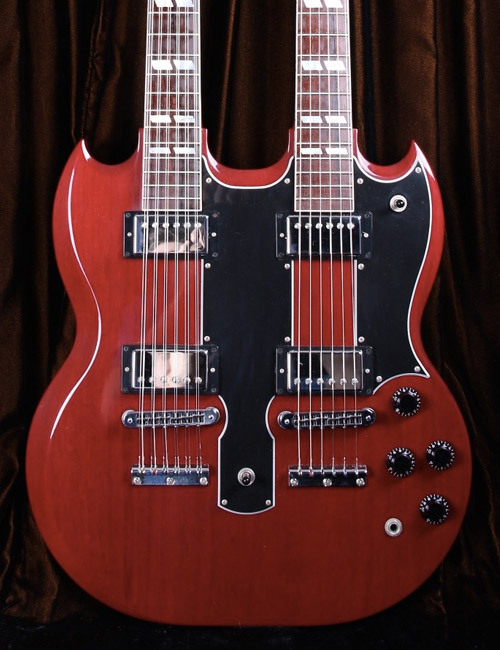 “It’s fairly widely reported that Page used a small to medium-sized amp made by the Valco company of Chicago, possibly a combo sold under the Supro brand name,” said Dave Hunter on Gibson.com. 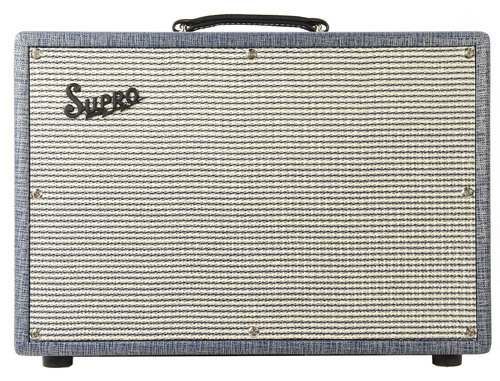 A Supro Thunderbolt, with a single 15-inch Jensen speaker and a pair of 6L6GC tubes in the output stage, is a likely suspect, he added. Others have speculated that it was a Supro 1690TN Coronado that was heavily modified, with a single 12" speaker replacing the stock 2x10" speakers, a configuration that the newly relaunched Supro brand now offers in its new 1695T Black Magick amp. To the extent that Page has a signature tone, it’s that of a Gibson Les Paul Standard, equipped with humbuckers, a moderate amount of overdrive and plenty of sustain. While the combos listed above all will help you get a little Page-y, a head and cab obviously will push more air, maintain higher volumes, support heavier riffs and create a more Zeppelin-esque sized sound. With the EQ balanced between the lows, mids and highs — start at the 12 o'clock position and cut or boost from there. With some overdrive from the amp, then look to your pedals for additional overdrive, distortion and boost. Xotic SL Drive to approximate gain from a Marshall Plexi / Super Lead; then use your volume knob to adjust the amount of gain. These pedals clean up nicely when rolled down. JHS Crayon. Page was known for going direct into the board for some classic riffs on songs such as "Black Dog" and "No Quarter." We approximated this with the JHS Crayon, which aims to replicate the sound of overdriving a British voiced preamp section on a mixing console. As with anything, be sure to use any effects or tone shaping in moderation. It's easy to get carried away with some of these effects, especially when used in combinations. You will want these tones and effects to come through prominently, but you don't want to lose yourself in a wash of overdrive and wah pedals. While Page has been relatively consistent in terms of his guitars, amps and pedal selections, the single most important component of his sound throughout his career has been his hands. So, if you’re really intent on nailing the Page sound, plan to invest some real time and effort in listening and practicing.